Splice Technologies' "Ceramic Ribbon" series fusion splice protection sleeve is designed to accommodate 2-12 ribbon fiber. This product is constructed with an inner EVA meltable adhesive tube, a polyolefin heat shrink outer tube and either single or dual strength members. 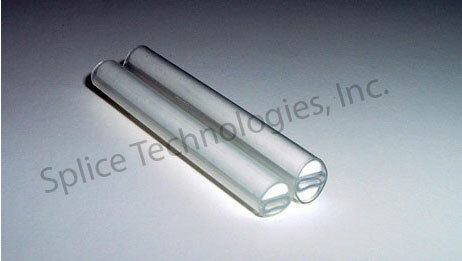 Our single strength member sleeve has an after shrink diameter of 4.9 X 4.4mm. Our dual strength member sleeve is designed to "sandwich" the ribbon, thus eliminating any undue stress on the fiber, and has an after shrink diameter of 5.7 X 4.9mm. These products utilize solid white ceramic strength members and are a lower cost alternative to our clear glass strength member products. The entire assembly is designed to ensure that all members maintain perfect alignment during shipping, handling and shrinking. We are proud to say that all of our products are made here in the USA and most sleeves are in stock ready for immediate delivery.